A security guard at Michael Jackson's Neverland ranch testified Monday that he caught the pop star's teenage accuser and his brother with a bottle of wine, and a maid told the jury that she saw adult magazines in the brother's backpack. Defense attorneys in Jackson's child molestation trial called the Neverland employees to challenge prosecution claims that it was Jackson who exposed the children to alcohol and adult materials — suggesting instead that the boys found the items on their own. The defense also attacked the family's claims of being held against their will, calling witnesses who said there was no hint of captivity when the mother went to a spa for a body waxing or when her children went to an orthodontist to have their braces removed. The trips to the spa and orthodontist occurred at a time when the family was allegedly being held captive by the pop star and associates. The mother has described the dental visit as a ruse to try to escape. But Jim Moret, a courtroom observer, tells CBS' Maneul Gallegus that today's testimony implied that the family could have left the ranch should they have felt trapped. "They were left alone, they could have called for help, they could have escaped," Moret said. "The didn't. The implication is they didn't because they weren't being held against their will." Jackson, 46, is accused of molesting a 13-year-old boy in February or March 2003 and giving him wine. He is also accused of conspiring to hold the boy's family captive to get them to rebut a TV documentary in which the boy appeared with Jackson, who said let children sleep in his bed but it was non-sexual. Prosecutors have said that Jackson showed the boys sexually explicit material on the Internet and in adult magazines, suggesting it was a precursor to molestation. Security guard Shane Meredith testified Monday that he found the boys in the wine cellar, which has an entrance behind a juke box in Neverland's arcade, after noticing that the juke box door was open. Meredith said he went down the stairs and surprised the boys. "I saw the two children laughing, giggling," Meredith said. "I could see them with a bottle of alcohol. ... I told them they needed to get out of that area right now. ... They were pretty shaken." Meredith noted that the bottle was half-full. Neverland maid Maria Gomez also testified she once saw adult magazines in a backpack that she believed belonged to the accuser's brother. The backpack was in a guest unit. Testifying through a Spanish-language interpreter, Gomez also said that the boys' mother praised Jackson as "a blessing to them," but about a week later "started talking about being there against her will ... that we should help her leave." Gomez testified that the mother indicated she was being held by three people including Dieter Wiesner, who is among Jackson associates named as unindicted alleged co-conspirators. 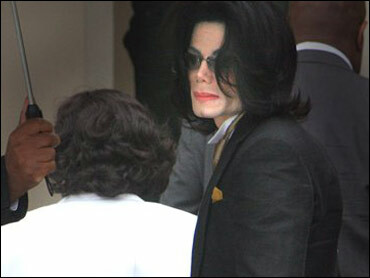 The defense has sought to suggest that the associates were actually conspiring against Jackson to profit off his troubles, rather than conspiring with Jackson. Earlier, witnesses testified that the family gave no indication of needing help during the spa and dental appointments. Carol McCoy, a skin care specialist, said that on Feb. 11, 2003, she did a full body wax on the mother, who had been dropped off at the spa and was free to leave at any time. "Did she say anything or do anything that suggested she was being restrained in her liberty?" asked defense attorney Robert Sanger. "No," said McCoy, who performed a $140 waxing procedure on the mother. Orthodontist Jean Lorraine Seamount and assistant Tiffany Haynes described a visit by the accuser and his little brother, older sister and mother on Feb. 24, 2003. Seamount testified that the mother said she wanted her children's braces removed because the orthodontist who had put them on had "found out who she was" and wanted more money. Seamount said she advised against the removal but the mother insisted. Both Seamount and Haynes criticized the behavior of the boy who is now Jackson's accuser. Haynes said he was "rude" and Seamount said he went through drawers containing sterile items. Neverland worker Kathryn Bernard also told of taking the mother to town to go shopping. "She was just praising Michael and telling me how bad she had it with her ex. I kept thinking, 'I don't know this lady and why is she telling me this?"' Bernard testified.